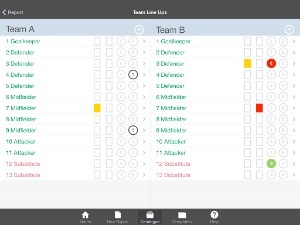 Designed by a professional scout working in the field to assist in their daily routine of note taking for a football match/player report, Elite Scout, allows the user to record team line ups, match tactics, take notes on individual players - all on an interactive real-time notepad and tactics board. Use the default match/player report template or create your own, designed specifically to help meet your club’s requirements. Take notes on individual / team tactics throughout game, indicate real time events such as yellow / red cards, goals and substitutions. 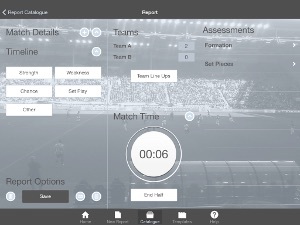 The interactive tactics board allows the user to show team formations, highlight changes and player’s roles during the game. Use the drawing options to add arrows and shapes onto the pitch. The inclusion of set pieces allows you to show player positioning at corners. 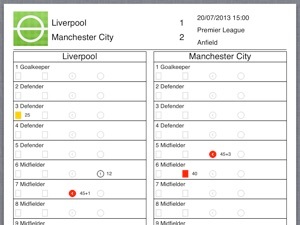 With the cleverly designed match template all notes are grouped into sections relevant to match tactics. Move players on the tactics board and take notes on specific individuals throughout the game. Hit the clock to indicate the start of the match and every match action is recorded to the timeline at the correct time. Users can also highlight specific team actions such as strengths and weaknesses, goal chances and set pieces as and when they happen. These are all recorded to the timeline and can be sent to back to your club as soon as the match ends. Elite Scout saves and creates a PDF with all tactics / individual notes / game actions grouped together into a match/player report and can then be emailed straight to your club.